CMT’s Karaoke Star Auditions LIVE in Winnipeg Wednesday May14th! It’s lights, camera, action as CMT with host Paul McGuire come LIVE to Winnipeg with cameras a blazin’…HANK FM and CMT presents Karaoke Star 2008 and you could be on the show! This is CMT’s first stop to Winnipeg for Karaoke Star (basically a country Canadian Idol except Karaoke, and you can get your shot at the mike on Wednesday, May 14 at Cowboy’s Roadhouse in Canad Inns Windsor Park – where CMT will be LIVE to do the judging. The Top 10 finalists on May 14 will return to compete on May 15, when the judges will select 1 finalist to fly to Toronto to compete for $10,000 in the live two-hour finale on CMT on October 2nd! If you want to be a country karaoke star, check out CMT.ca or HANK.FM or details and be at Cowboy’s at 4 p.m. on May 14th for CMT’s Karaoke Star 2008! Brought to you by CMT and Continuous Country 100.7 HANK FM ! Let’s face it who likes to wait in line? Not us…that is why 100.7 HANK FM and Cowboys Roadhouse are thrilled to bring Winnipeg the” Jump the Gun to Karaoke Star 2008” contest, where four lucky people will get the chance to “Jump the Gun” and be one of four to be first inline at the official CMT Karaoke Star 2008 additions on May 14th LIVE at Cowboys Roadhouse. For four weeks every Thursdays nights at Cowboys, starting Thursday April 17, 100.7 HANK FM and Cowboys Roadhouse will give four lucky people the chance to “Jump the Gun” and win one of four spots at the front of the line for the CMT’s Karaoke Star 2008 auditions May 14th. Each Thursday night one person will win a spot at the front of the line, at the CMT Karaoke Star auditions, that’s one person each week for four weeks that will have bragging rights and an awesome prize pack. The Jump the Gun contest is very similar to a Canadian Idol competition (no music, just 6 – 8 bars of your lovely voice). If you or anybody you know love to sing country and would like to win a spot at the front of the line for a chance to win $10,000, then come down to Cowboys (Canad Inns Windsor Park) every Thursday until May 8th. Visit our website at www.hank.fm for all details. Q: Where are the official CMT Karaoke Star 2008 auditions being held? A: Cowboy’s Roadhouse in Canad Inns Windsor Park – corner of Lagimodiere and Elizabeth. 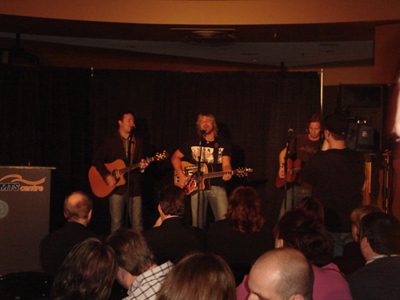 Q: When is CMT coming to Winnipeg for the official Karaoke Star 2008 auditions? Q: How do the Karaoke Star auditions work? Q: How can contestants enter the regular Karaoke Star 2008 auditions? A: cmt.ca or hank.fm and click “Karaoke Star 2008” Auditions and download a form that they will need to hand out and submit to registration in person by 8pm on Wednesday, May 14th at Cowboy’s Roadhouse. Q: How can I sign up for the Jump the Gun contest and win a spot at the front of the line? 2. Show up in person: Come down to Cowboys April 17th, 24th, May 1st, and May 8th and visit the HANK table to sign up. Q: Is there a song selection for Jump the Gun? A: NO. You may sing any song that you wish! Q: Is the Jump the Gun contest karaoke style? Q: Can I audition more than once? A: You may only audition once a night but you CAN audition every week! Q: Do I have to be present in order win on the night that I audition? WINNIPEG, December 5, 2006 - The Canadian Country Music Association (CCMA) today announced Winnipeg as host city for the 2008 Canadian Country Music Week and Awards, to be held September 5-8, 2008. This marks the third time Winnipeg will host Canada's largest country music event. The Chair of the CCMA, Heather Ostertag, officially announced the awarding of Country Music Week 2008 to the City of Winnipeg, acknowledging that more than two decades had passed since the event was last held in that city (1986). Ostertag added, "The CCMA is very pleased to return to Winnipeg and the Board of Directors invites both the community and our industry to join in and help make this a wonderful celebration and a wonderful opportunity for Canada's talent." Music is integrated into the fabric of Winnipeg and Manitoba, and shapes the heartland of Canada's musical tradition. Artists such as Neil Young, Doc Walker, The Guess Who, and countless others launched their careers here. "Manitoba has always been a great place for music and artists," said Premier Gary Doer. "We were proud to host the JUNO Awards last year and just this year we hosted the Western Canadian Music Awards and the Aboriginal Peoples Choice Music Awards. With this announcement, we will show the country yet again that Winnipeg is a music town." Canadian Country Music Week and Awards is one of the largest music events in Canada. "The Canadian Country Music Awards will be another tremendous opportunity to showcase our city to a national audience," said Mayor Sam Katz. "Winnipeg is certainly excited to play host to the hottest talent in Canadian country music and I know our city will once again step up to the plate and deliver a world class event." Winnipeg presented a strong bid to the CCMA and was awarded the event based on a combination of solid commitments from the Province of Manitoba and the City of Winnipeg, excellent host facilities, a solid track record in hosting major events, and a long established reputation as a city that embraces Canadian music and culture. Kevin Walters, Co-Chair of the Winnipeg Bid Committee with Ray Martin said, "We are thrilled to welcome Canadian Country Music Week to Winnipeg in September 2008. Our committee looks forward to working with the Canadian Country Music Association over the next two years to plan a weeklong celebration of country music in true Winnipeg style. More than 1,000 members of the country music industry will descend on our city to enjoy workshops, parties and the Country Music Awards. The people of Manitoba are in for a great event!" "True North Sports & Entertainment Ltd. and the MTS Centre are proud to once again play a role in bringing another major event to our province. We are confident that the MTS Centre will help showcase the best in Canadian country music and give Manitobans the chance to be a part of this fantastic event," commented Kevin Donnelly, Senior Vice President & General Manager, MTS Centre. Several venues in the Winnipeg area, in addition to the MTS Centre who will be playing host to the 2008 Canadian Country Music Awards, will be showcasing special entertainment events that customarily accompany the annual Canadian Country Music Week. Location and programming details will be announced at a later date. "Canadian Country Music Week in Winnipeg 2008 will, like the 2005 JUNO Awards, showcase excellence in Canadian music and provide significant economic benefits and national exposure for our city," said Stuart Duncan, President of Destination Winnipeg Inc.
Manitoba's Doc Walker performs at CCMA press release. Bid committee Co-chair Ray Martin interviewed by media.